click Amazon to order it. Laura J. Hickman has been writing her whole life. During elementary school, while living in Northern California, she found her passion for writing when her English teacher asked each student to write a story about how they would react if an earthquake hit. After that, she began to write short stories, poems, and novels. She currently lives in Las Vegas and does not let the heat stop her from creating new worlds, new characters and new plots. She has run the Las Vegas local group of National Novel Writing Month for the last 2 years (2008 and 2009) and Script Frenzy last year (2009). She is planning on running the region again in November to help all her writer friends to finish a novel in 30 days. 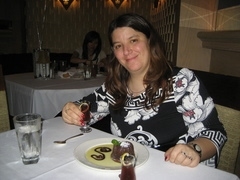 Laura is the founder of the Las Vegas Creative Fiction Writing Critique Group. One of Laura’s goals is to inspire others and herself to be creative. Recently a very good friend of Laura's dared her to start submitting her work. With that dare in place, Laura has received numerous rejections, like most writers, however, she has received acceptances from6 Sentences: The Mysterious Dr. Ramsey and Mind Games, also by the Pill Hill Press for their upcoming anthologies Fem Fangs, story titled “Animal Lover” and 2011 Daily Flash:365 Days of Flash Fiction, story titled “The Mighty Pen,” and she has had two stories accepted to FlashShot, “Safer Inside” on July 11, 2010 and “Love is a Four Letter Word” on July 30, 2010. Laura has lived all over the country and her experiences over the years helped shape her writing. Her two favorite places to set stories are in New Orleans and Las Vegas. She graduated from Louisiana State University where she studied English and Film. She continued her education at the University of West Florida studing Film and Television Production, along with Scriptwriting. She has two completed novels, “Ryan Says” and “Cat Scratched” along with a screenplay “Looking For Love,” which has been compared to “500 Days of Summer”. She is working on two novels right now, one untitled about a couple of band members who rob banks while on tour, and a serial killer story called “Double or Nothing.” Her ultimate goal is to have a published novel and have her screenplay picked up and turned into a movie. Laura would like to thank her critique group, her family, friends and loved ones for all the support they have given her over the years. You can follow Laura's blog, check her Facebook page and her Twitter page.